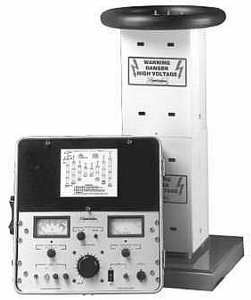 The 8000PL Series DC Hipot Testers offer a 60 to 300kV range in a convenient cascade design. These systems are air insulated, with each module individually capable of producing 60kV at 16mA. The standard power rating is 2kW. Low leakage measurement, even with fluctuating line voltage, is possible with 1% line regulator. The design also offers reverse polarity. This modular (expandable) construction favours the use of these portable testers in situations formerly requiring large mobile units. For example, when field-testing each technician can be equipped with one controller and as many modules as routine tests require. Then, for any non-routine higher voltage tests, additional modules may be assembled at the test site. For example, a 240kV test requires one controller and four modules. Each unit consists of a control case and one or several 60kV modules up to the required voltage. For expansion above three modules, a HV expansion kit is required. This kit contains an anti-corona toroid rated for up to 300kV, plus base extension legs and guy straps for support. The lightweight fiberglass control case includes all operating controls and meters, plus storage area for the base grounding probe, output resistor, and interconnecting cables. Expandable from 60kV to 300kV. Rugged, portable and modular construction. High current output for testing large loads. Ripple < 0.2% per mA. Analog kilovolt and current meters. Compact control unit allows remote positioning ideal for field use. Optional high voltage shorting solenoid. suitable for field orientated applications. Quick and easy - a modular system limits the setup time and user-friendly controls make it simple to use. Easily Transportable - Air-insulated modules make it light weight and simple to transport in a van or pickup truck. Accurate Leakage Current Measurements - while guard circuit eliminates stray leakage currents. Qty 1 DA13-280 Ground stick, 120kV max.